Literature: Laurent Ferrier is prominently featured in Watchmakers, The Masters of Art Horology by Maxima Gallery pp 136-159. Laurent Ferrier took the watch world by storm with the introduction of the Galet Classique, a superbly classical yet suave timepiece with a phenomenally gorgeous and painstakingly hand decorated tourbillon movement that could be admired from the back. Ferrier spent almost all his professional career at Patek Philippe as technical director in charge of product development, but at an age where his colleagues were leaving on a well-deserved retirement, he decided to embark on a new adventure filled with adrenaline, creating his dream watch with not a shred of compromise. The present Galet Secret has the complete Ferrier genetic codes and more. The large curvaceous case has a tactile elegance, the tourbillon movement features a double hairspring balance, which consists of two hairsprings one atop the other but beating in opposite directions, one spring erasing the variations of the other permitting greater accuracy. The dial side is even more interesting has nothing to shy from as it is a potent mix of elegant classicism and sheer flamboyance where the owner can at a push of a button switch from one to the other. As the name implies the present watch hides a secret behind the tinted sapphire dial. A complex device pivots the dial’s two opaque crystals at a full 240° like a fan opening to reveal a dial set with baguette diamonds for a total of 4.6 cts. The dial aperture can open or close on demand by push of the crown or at the time set by the owner. In this case at 9 o’clock the system starts switching over the display until its complete unfold in 60 minutes. The diamond set dial will remain visible for twelve hours until the sapphire apertures start closing. 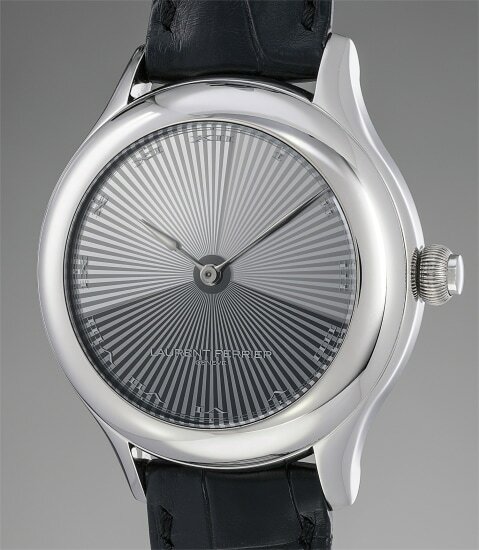 The time of opening of the dial can be modified at the request of the owner. Serendipitously, the movement number is 007 and the watch would definitely be a perfect attire on Mr. Bond’s wrist concealing or revealing the hidden dial depending on the moment! A unique piece, the present Galet Secret offers the best of all worlds, ultimate rarity, technical complexity and a watch that can go from apparent simple classism to glittering panache. As such it has its place in any collection as the proud representative of contemporary independent watchmaking. Introducing its first watch to critical acclaim in 2010, Laurent Ferrier was founded by long-time Swiss watchmaker of the same name. Following a 37-year career at Patek Philippe, Ferrier founded the brand in 2008, creating timeless wristwatches inspired by the finest wrist and pocket watches from the nineteenth and twentieth centuries. Revered by collectors around the world for their genuine innovations and understated elegance, the brand specializes in exquisitely hand-finished movements featuring state-of-the-art watchmaking technology. Galet, or "pebble" in French, describes the signature feature of the brand's cases used across its collection — with soft curves, domed crystals and rounded edges reminding one of a smooth pebble. Key models include the Galet Classic Tourbillon Double Spiral and the Galet Micro-Rotor, with stunning movement architectures designed after prestigious observatory chronometer movements of the twentieth century.